A good place to begin understanding this is by reading pages 199-247 from Home Education (volume 1) by Charlotte Mason, herself. Reading Instruction: Charlotte Mason's method included sight-recognition as well as phonics. AO mentions a few programs that have worked with Advisory members, but use whatever you like. Once children are able to read, they should be reading many or most of their schoolbooks for themselves. Transcription: We tend to call this copywork. This means practicing the physical skills of learning to write, first by perfectly forming each letter, and later by copying sentences or paragraphs. Narration: Another word for this is "oral composition." Each time your child narrates, he is mentally composing his thoughts and communicating through words. Written narration begins around age 10, and if you allow a year or two for fluency to develop, then anything like "creative writing" begins about that time. Creative writing will be an extension of written narration. Grammar: Charlotte Mason didn't have children doing grammar until Form II, so AO places it in year 4. 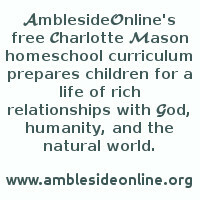 You can use Charlotte Mason's own Simply Grammar, or one of the other grammar programs mentioned on the AO site. As far as what is included in English for the Thoughtful Child--you can probably incorporate that information into your copywork/transcription. Scope and Sequence for Language Arts? In grammar there's only a small body of knowledge to learn--it doesn't need to take years and years to learn it, and it doesn't need to start in first grade. Students will pick up grammar concepts without years and years of formal training if they read books. Trust the process! By the end of elementary school, students only really need to know two rules: (1) Capitalize sentences and proper nouns. (2) End sentences with punctuation (a period, question mark, or exclamation point). It's also useful (but not vitally necessary) to be familiar with thefollowing so that, when grammar is learned later, these concepts aren't totally new. This is only a suggestion. Don't worry if you haven't covered these, and don't feel pressured to rush out and buy a curriculum to teach them. They can be introduced naturally during routine school reading. All your child needs is to be able to identify these in a sentence: The four kinds of sentences (question, statement, command, exclamatory) and the eight parts of speech (conjunction, noun, verb, adjective, adverb, preposition, interjection, exclamation). When you begin written narrations, you can introduce more punctuation. Don't teach the mechanics of writing before students actually writing! This might be around year 5 or later. Two years after beginning written narrations, you can begin to focus on style. The most effective way to teach language arts is to get your child reading their school books themselves as soon as possible. When reading aloud, your child's mind may wander. Also, he isn't seeing the words on the page, so he's not seeing the spelling, sentence structure, punctuation, and he isn't being challenged to push his reading levels. When you read all your child's school books to him, he isn't learning to spell, you are. So read aloud a fun story to enjoy together, but your student should be doing his own reading for school. I took an hour or two to search the archives for what has been said before about spelling and writing Charlotte Mason style. I compiled the information below from my posts, but there were lots of other good ones by other people. If anyone has time, you might try to search the archives to see what else is there. First of all: Charlotte Mason differentiates between spelling and reading--and I think she's right to some degree. Phonics rules help immensely with reading (and she does talk about this a little in the pages that lead up to her discussion of spelling in volume 1). They help a lot, but not quite as much, with spelling. Think of words like There and their--and is there really any reason why they shouldn't be spelt thair or thare? Think of the 'r-controlled vowels,' er, ir, and sometimes 'or' (word, work)--phonics gets you to a point with those, but a little memorization is necessary after that. In general, what Charlotte Mason suggested for spelling is that the spelling word be written properly where the child can study it. He doesn't copy it ten times, he simply looks at it with all the focused attention he can muster up. When he thinks he has memorized the way the word looks, ask him to close his eyes and picture it. Then have him spell aloud. When he can do this properly, you might ask him to write it correctly. We use a whiteboard to do this. Of my four children who 'do school' currently, the oldest was a natural speller. The other three have varying levels of spelling incompetence.=) I nearly despaired of the second girl ever learning to spell. She misspelled words she copied. I began using Miss Mason's method with her when she was about twelve. I do not know if it was the method or the age, but she did begin spelling better, and I now am not embarrassed for us both over her spelling. The 11 and 12 y.o. Still need to work on their spelling, but I figure it will improve by high school. You could also use a good word processing program, one that automatically underlines misspelled words (in case you can't tell, I am not using one in this post and since I am typing on a laptop, I have many errors). Then have him use his right click mouse button--this brings up a box with suggested corrections. He then would instantly have the properly spelled word before him (albeit with several other options, but they would all be spelled correctly) and could choose that. He might take a moment to visualize the word carefully before going on. Here is what she suggests regarding dictation. I think it's possible that the child selects the passage from his reading (I know that she says this for younger children doing copywork). Oh, and she says children of 8 or 9 should do a paragraph, older children 'a page or two or three!' I assume then that the younger children are not doing this at all (I think I know what they do, and it would require a whole other post to explain). Frankly, none of mine have been ready to write a paragraph at 8 or 9, but I'm just passing on what I understand of Miss Mason's suggestions. Then the child 'prepares' the passage himself (this is onpage 242 of volume one). This preparation involves having the child slowly look through the passage and anytime he comes to a word he thinks he can't spell he is to look at it attentively, then close his eyes and picture it with his eyes shut. After a bit of this, the teacher or mother asks him what passages he is still unsure of, and at this time may point out others that she thinks might give him trouble. He looks these over again, using the same method--just trying to look at the word carefully enough that when he closes his eyes he can picture it accurately. If there are any words still worrying him, the teacher writes them one by one on a chalkboard or whiteboard (this could work in a classroom, but the whole class would be suggesting words, so some words would be covered that some of the children are not worried about). Again, the child looks at the word writ largely on the board, looks until he has a picture of it, and then she erases the word and moves on. The child decides when he is ready for dictation. Now, where I am very skeptical is that this whole process, she says, should take only five to ten minutes! Finally, the teacher starts giving dictation. She enunciates clearly, reads a clause at a time, never repeating herself. She does not say 'comma' or give any other indication of punctuation except for her voice inflection. At this point she is ready with her stick it note or masking tape or label with which to quickly cover any misspelled word. At any rate, this is dictation Charlotte Mason style, or at least, how she recommended at the time she wrote volume one. She may have changed her practices later, as she did in other areas. However, it's a very important part of Charlotte Mason that Handwriting is the preliminary step in copywork or dictation. Until a child knows how to make each letter and make it well, with little mental effort or decision (in other words, habit) letter practice is pretty much all that copywork encompasses. So dictation isn't begun until copywork is mastered, and copywork actually begins as handwriting and letter form practice. Once these are mastered, it is for exposure to the best in writing. Copywork done properly forces a child to slow down and absorb the punctuation details, notice capitalization, and internalize sparkling prose (For this reason, a child's own stories are not the most ideal source for copywork a la CM). Finely crafted, well written sentences are the best sources. In our home we have a different selection each day of the week. One day is poetry, another Bible, another from their history, another from Science, and one from their literature selection. A copywork selection from the foreign language being studied is also good. Hymns may also be used. Until you are sure a child can form all his letters correctly, you would not give him a selection to copy, and at first you would still watch carefully to see that he formed them properly--shaping them properly, starting at the right point on the paper, holding his pencil properly. You could still practice spelling (by the way, Miss Mason recommends spelling practice be based on word families) but with letter tiles instead. You could use magnetic letters, scrabble tiles, whatever--and the child can rather painlessly practice spelling this way (spell the word you dictate, using the tiles, then picture it in his head clearly). Value of Transcription--The earliest practice in writing proper for children of seven or eight should be, not letter-writing or dictation, but transcription, slow and beautiful work, for which the New Handwriting [a handwriting text] is to be preferred, though perhaps some of the more ornate characters may be omitted with advantage. Transcription should be an introduction to spelling. Children should be encouraged to look at the word, see a pciture of it with their eyes shut, and then write from memory. Children shold transcribe favorite passages--A certain sense of possession and delight may be added to this exercise if children are allowed to choose for transcription their favourite verse in one poem and another. This is better than to write a favourite poem, an exercise which stales on the little people before it is finished. But a book of their own, made up of their own chosen verse, should give them pleasure. Small Text-hand--Double-ruled lines--should be used at first, as children are eager to write very minute 'small hand' and once they have fallen into this habit it is not easy to get good writing. A sense of beauty in their writing and in the lines they copy should carry them over this stage of their work with pleasure. Not more than ten minutes or a quarter of an hour should be given to the early writing-lessons. If they are longer the children get tired and slovenly.) 238, 239 (this section of volume 1 in the six volume series is especially useful for the language arts. Pages that follow cover dictation, spelling, composition and more). Copywork is a very different thing from composition (although the material you use for copywork should also be a model of good writing). Charlotte Mason's approach to composition begins in the primary years with the skills developed through oral narration (thus one reason for using the most excellent books you can find). The child learns to express himself clearly, to pay attention to detail and sequence, to use appropriate vocabulary, etc. Rather than having to contrive a subject for composition, the subject and material is provided. Original writing (diaries, letters, stories, poems) should certainly be encouraged if the child is interested, but it is not taught formally at this stage. Older children transition into writing their narrations, and at that point (the junior grades) Charlotte Mason mentioned having them write occasional compositions on such topics as current events and things they had observed in nature. This process (developing writing through narration--which can take many forms, including journal entries, putting something into verse, writing a new scene between fictional characters, writing a news item) continues through the school years. I've also heard that in at least one PNEU school, the reading of Shakespeare on Friday was followed up with a period on Monday when the students (of around 12 and up) wrote out what they remembered and understood from the reading. The high school students of CharlotteMason's day did study composition more formally as well. The ability to write well was certainly never downplayed by Charlotte Mason; but she did believe that it could be developed in a more natural way than by requiring much original work at too early an age. This is my own experience with a reluctant writer, poor speller, auditory learner boy of similar age. We did nothing but copywork up through age nine. My son misspelled words during copywork. When he wrote something (on his own--I never assigned it), his spelling was truly appalling. At age 10, we began writtennarrations, and I tried working on a few basic spelling rules. They didn't stick. I remember we spent two weeks on one rule. In a written narration soon after, he correctly some big word, but misspelled three words that should have followed the rule he supposedly knew. I was never consistent with dictation--we rarely did it--because it was a frustration to both of us. A year or so ago, Donna-Jean wrote about dictation being the antidote to bad spelling (or something like that). It really stuck in my mind, and I think she is right. I should have been doing dictation from age 8 or so. I kept waiting for that natural improvement, and I admit that there was some of that. This child is 11 now. He does written narration several times per week, and we still have spelling issues. We do dictation twice per week (last term it was just once per week), and I am again introducing some basic spelling rules. His spelling will probably never be great--he more auditory than visual, by far, and tells me cannot picture a word in his mind. (He mis-pronounces words to himself in order to remember how they are spelled. I used to do that!) At least you know you're not alone! I would begin dictation with him. I think it is very important to take dication from the books your child is reading for himself. Those are the words he is "seeing" again and again, and he will have more success with that than with dictation from a harder, read-aloud book. When Charlotte Mason said that children "prepare" a paragraph, or whatever, I think she meant that they looked it over and were prepared to write any part of it. But, I still think only a few sentences were dictated. When we do dictation, I have my son read over the paragraph, look at the words, punctuation, etc. . . . but then, I only dictate one or two sentences. For older children "preparing" 2-3 pages, maybe a paragraph would be dictated. Correct me if I'm wrong, but I don't think they really wrote that much. The mental exercise of looking at the words intently beforehand was half the point of the practice. Oh--one more thing that I have done with my son is let him learn how to type. He types his written narration, and so the physical act of writing is not a burden to him. I believe that Charlotte Mason would say that narration is oral composition. So, in effect, every time you ask your child to narrate they are composing on a selected subject. When an AmblesideOnline student starts to write narrations, starting about year 4, we hope that they will be able to transfer their oral skills to the written page. We hope that their developing sophistication with oral storytelling will also transfer, though from what I have observed from my own children, it takes a while because they tend to simplify and shorten their storytelling if they know they have to write the story down. Copywork or transcription is a method of teaching handwriting and reinforcing spelling and grammar usage. It does not really teach composition, though it should provide good examples. I don't have any experience with Writing in Excellence, so I can't comment from my own experience with the curriculum. It does sound like it could be quite compatible (possibly with modifications) with the Charlotte Mason methods of teaching, and may also provide some valuable input to the teacher. I do have some comments on what was shared, however. Ihave a concern that requiring that children to select words from some material they are about to narrate from, and then requiring that they narrate using these words or covering those topics may direct the attention away from the flow and meaning of the story as a whole. It may also serve to squash a child's enthusiasm about telling a story about a particular reading. Enthusiasm is precious, and in storytelling it gives our words power and style that really is very difficult to teach. I believe that Charlotte wanted to harness enthusiasm and use it to help teach good habits of composition. Children more readily provide detail and color their stories through careful word selection when they have some enthusiasm for telling the story and an attentive and appreciative listener. However, not every child narrates enthusiastically (though I dare to say that they can narrate about something enthusiastically), and some children and teachers may profit from more guidelines or structure. I just don't know enough about this particular curriculum to say any more. Question: "I know that Charlotte Mason states in Book 6 that narration in Form IA and B was mostly oral, however she also says that children in Form IA from ages 7-9 have more copious composition, implying that she gradually added composition in the:form of written narrations." Question: "At what point should we expect our children to make:the transition from mostly oral to mostly written compositions?" Compositions begin to be written somewhere between 9 and 12. That's not much of a guideline, and probably most children will be ready between these ages--at 10 or 11. But even at this age, "composition" is simply written narration, and does not involve instruction about paragraphs, etc, . . . Not until Form III--jr. high level--does composition become a matter for direct attention. Written narration never completely replaces oral narration, and I'm not even sure it ever surpasses oral narration in quantity. Common sense tells us that children cannot write as much or as fast as they can tell. Also, as you move into the high-school level, the pupil's written narrations become more complex and thoughtful, not just factual re-tellings, and no one can write like that for several subjects every day. I really think there are no hard and fast rules for this. There are no doubt children of 8 and 9 who are truly ready to write narrations (in fact, I remember one AmblesideOnline child of 6 who did so voluntarily). And there is no reason to hold them back if they can do this. The average child will be ready by 10 or 11, anyway. I began written narration last year with my then 10yo son. By the end of the year, he was doing one written narration per week, plus one longer, more focused written narration once per month. This year, he is typing well enough to use the computer for his narrations, and he writes about 3 times per week, plus does the occasional, longer narration. Most of this work is not spectacular, and at this point, he is still building his skills and getting into the habit of getting his thoughts "on to paper." Here are a few tips (just my own opinion, not wanting to sound like an expert here) for being the Mom when your children do their written narrations--especially early ones! Have your child read them to you! My editing-eye catches every misspelled word, I sigh (even if not out loud, I sigh inwardly) and go off on a mental tangent about why this child can't spell and what I'm doing wrong and what she's doing wrong and how they'll never succeed in life if they can't spell and how bad this makes us both look if she can't spell--and meantime, my astute child is reading my face for reaction and knows I am disappointed in something she has worked on with diligence, enthusiasm, and eagerness. 2) Have your child read aloud their written narration to you! I can't tell you the number of times my dd has read her narrations aloud to me and suddenly said, "Oh, wait! I spelled that wrong!" or "Oh--wait! That didn't make sense--I forgot to put this word in . . ."
Here's an important point--what is narration for? Narration is your child/student connecting with the material, getting in touch with the facts clothed in literary language, getting to know an artist, a poet, a general, a mythological story, a brave young girl, a foolish animal, a truth . . . and then relating those ideas articulately. The articulate part will develop and grow (though it is often evident in beginning narrations . . . I think I mean the articulate part will get more "polished"), because this is teaching composition skills! Do you remember writing a first draft? Well, written narrations are like that--they are written with the intent of writing, of expressing . . . with one exception--they are not meant to be re-written over and over and over. That would kill the spirit of the child to have to correct and re-write every narration (assuming you are requiring somewhat frequent narrations). To me, listening to my child's written narration is listening to their heart. I can "hear" what they understood and valued--and I can offer respect to their composition by listening. Two added things--1) I do then look at the written narration. I make gentle comments like "Next time, you might want to remember to make breaks to show where the paragraphs go." I also note (sometimes mentally) the misspelled words--to use in dictation of other material, and to watch to see when they improve. "I do think this improves with time. I also choose one problem area at a time and work on that. It might be run-on sentences, or it might be passive sentences. Use your word processor to help you. I have mine type with the spell check and grammar check on. With the grammar check, they are supposed to ask me before they make changes, as this is more prone to computer error than the spellcheck. My 17 y.o. was a terrible speller when she was 11. She started to improve at about 14 or so. That's when I started really implementing Charlotte Mason's method of having the child just look at a word from a spelling list, trying to visualize the way it looks. I think that practice helped her develop her own skills and start paying some attention to what she was writing (prior to this she would mispell words she was copying). My 11y.o. is also a very poor spelling. Recently she's been motivated to exchange e-mails and letters with a friend in another state who is a fellow Lord of the Rings nut. She's been using the spellcheck and she commented to me today that she thought her spelling was improving because of this. I know the word processor may not seem very CM, but I think it fits with Miss Mason's principles perfectly. Writing Strands is one good program. Children around 11 or 12 are about the age Charlotte Mason recommends beginning some more formal grammar and composition instruction. The Elements of Style, by Strunk and White, is also useful for composition. How much time should be spent on each facet (penmanship, copywork, phonics, grammar) of language arts? We're less specific partly because so much of this depends on the needs and abilities of the student, and because we DON'T want to have to say "do this, do ten pages, use this book." The original sample PUS programs (from the 1920's) were not always very specific either; the how-to's came from CM's books and from the Parents' Review magazine, and the sample programs would simply state that Form II children should do pages 40 to 50 in the grammar book over the term, and that they should both work on their handwriting program plus copy two lines of Shakespeare perfectly per day. Re language arts/English, I'd suggest looking at the goals that you want each of these components (penmanship, copywork, phonics, grammar) to accomplish, and see whether there is in fact some overlap. (Don't forget the across-the-curriculum work that's accomplished by written and oral narration, too.) I haven't used ILL (Intermediate Language Lessons), for instance; but if you already have a grammar program, plus they're doing copywork and regular dictations (say once a week), plus narrating from their history/literature/science, plus reading poetry, then do you really need ILL? Again, I haven't yet had the opportunity to see the Imitations books, but how does that overlap with work you could be doing with the AmblesideOnline books? Would you use the Imitations books mostly for a resource, for suggestions to enrich the narrations; or would it be a whole extra course? You might also look at the time each child will be spending on school. Of course this will vary, but, for instance, my 9yo is up to about 3 hours per morning and she often has some extra reading. How do you break down your time?--say roughly, 30 minutes for math, 1 hour for reading (together or alone), 30 minutes for miscellaneous subjects like picture study and languages--that might leave you an hour, a third of your morning program, to devote to English subjects (spaced throughout the morning, not all in a block, probably). So that hour might be broken down into 10 minutes copywork, 20 minutes grammar lesson or something of that sort, 15 minutes working on spelling if needed, 15 minutes misc. . . . my point is that you have a limited amount of time, and you want to spend it carefully, on the things that are most needed and most productive. If you and your child are feeling burdened by having to fit in a lot of misc. English lessons on top of the good books that should be the core of the program, then yes, I would think you should probably cut it down some. Keep your goals for your own children in mind--do you want them to produce neater copywork, to master adverbial phrases, to write good business letters, to narrate clearly?--what are your goals for the next few weeks or months? Ruth's Beechick's advice has always worked well for us--we have to teach the child, not the book. I think dictation is the area I have seen the most growth in my very reluctant 9 1/2 year old boy . . . (we've had tears too) I would encourage you to try again because it is the stepping stone to his written narrations. I used Robert Louis Stevenson poems, one stanza only at first and found them very simple, rhyming and manageabe. Take it in really small steps and be very encouraging. I also let my son copy his own narrations that I had transcribed from his oral narrations before he ever began writing on his own. It was rewarding for him to see his own thoughts on paper without having to trouble over the spelling etc . . . He is writing some of his own narrations now and I don't worry too much about the spelling. I hope that helps. The Charlotte Mason way works, but it is very different with each child, and definitely takes patience. You'll find that many specific comprehension skills are learned through narration--sequencing, main idea, details--and it's also good practice in listening, in speaking skills, vocabulary, and the more general idea of putting words together and telling a story. You'll see other things on scope and sequence lists for primary grades, such as homonyms and rules for dividing words into syllables. Again, you can teach those in a few short lessons--we like Ruth Heller's picture books about types of words. (Fred Gwynne wrote a couple of books about The King Who Rained, but I found those went over my daughter's head. Five in a Row uses a picture book called Truman's Aunt Farm.) It's easy to make up word games with things like homonyms--just make it the day or week's challenge to come up with the most interesting examples. Re syllables-my personal feeling is that too many rules about that are irrelevant at this age, except if it's a particular spelling problem that needs to be explained; I did teach my dd what syllables were, and we related them to music, such as counting the number of hand claps as we chanted lines of nursery rhymes. It's something to do while waiting for the bus. But if you want to teach syllables, go ahead.